Using the Apple program iBooks Author, teachers at Mercersburg Academy, an independent college preparatory school in south-central Pennsylvania, have created more than 20 interactive e-textbooks, with five more being readied for fall. The e-texts are part of a school-wide ebooks project and cover all subjects, from math and robotics to history and Latin. Most include embedded video and audio, animations, and links to outside source material as well as end-of-chapter assessments like short quizzes. 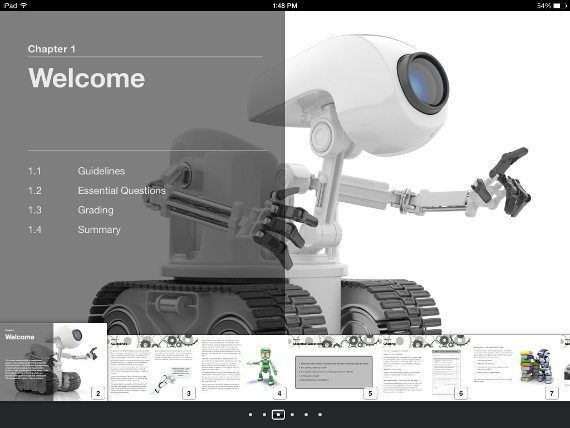 Students then access them via their own iPads, which the school requires each student to use. "I had been teaching Robotics for four years but developing my own textbook has enabled my students to move through and master the material at their own speed," said Julia Maurer, the academic dean for the school and the driving force behind the eBooks initiative. "The resulting new format of class time means I can spend more time with students who need help learning a concept." Tom Thorne, a Latin teacher at the school, has already authored three e-textbooks, and is using them along with the iPads to flip his classroom. "Rather than listen to one student work his way through a passage in class," he said, "I can check in on how all of my students are doing via the assessment tools in our eBooks, and then spend class time explaining the grammar and giving them the tools they need to solve the problems in their way."